Technoset has an enviable reputation for supplying complex components to the aerospace industry built up over a number of years. More recently the company has steadily increased its manufacturing capabilities and staff skills to move further up the industry’s tiered supply chain. At this level every little detail counts, which is why the Wogaard Coolant Saver plays a part in the ongoing business development. Part of the Techno Group, Rugby-based Technoset is a precision engineering company specialising in one-hit manufacturing of ultra-high precision turned and milled components. Having continually invested in the latest fixed and sliding head CNC machine tools with up to 13 axes, driven tooling and full turning and milling capabilities, the company is able to offer a high degree of flexibility to its customers. One of the most recent improvements on the shopfloor has come from the installation of the Wogaard Coolant Saver. The simplistic design and execution of both the Wogaard Coolant and Oil Saver belies the potential benefits it can provide to manufacturing companies. Using very few component elements it efficiently collects the cutting fluid which is normally dragged out of the machine tool by the swarf that is evacuated by the automatic chip conveyor or swarf auger and wasted. The neat oil or water miscible (soluble oil) cutting fluid is reclaimed by siphoning it from the chip-container and returning it to the machine tools main coolant tank for reuse. Using a vacuum generated within its body to draw the fluid out of any container the Wogaard unit is powered by the machine’s coolant pump, so no additional power source is required and fitting remains a straightforward operation requiring just a few pipe joints that can be specified in an optional fitting kit available for most popular machine tools. Today, except for one, each of the machine tools on our shopfloor has a Wogaard unit fitted and the housekeeping on the shopfloor is much improved. “We like to think that we are a forward-thinking company. As such, no stone should be unturned; you should look at the business from every facet. 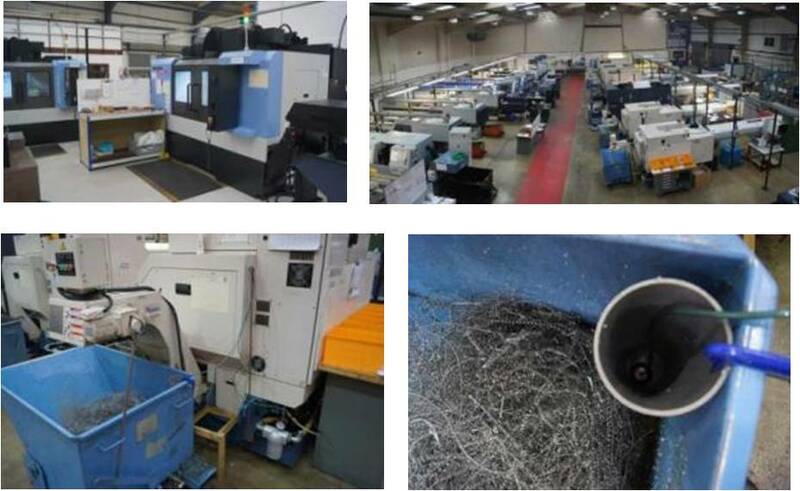 “There is simply no way we would go back to a shopfloor without the Coolant and Oil Savers fitted to the machines. Walk around now and the swarf bins are dry with material that is ready to be responsibly recycled. And we know the coolant, be it oil or water-based, is getting reclaimed and recycled quickly and efficiently back into the same machine tool’s sump so there is never any worry about cross contamination,” Kevan Kane concludes.